Dr. C.C. 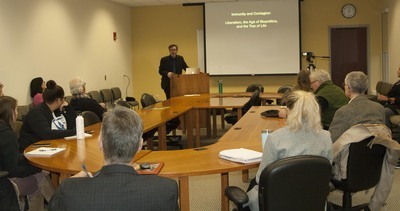 Wharram presents "Immunity and Contagion: Liberalism, the Age of Biopolitics, and the Tree of Life"
CC Wharram, director of EIU’s Center for the Humanities, helped to commemorate the 100th anniversary of the Great Influenza pandemic by addressing the long history of biopolitics in his talk about the 300th anniversary of smallpox inoculation. We think of biopolitics as a condition brought about recently, or at the very least in the 20th century, yet scholars in varying fields of research have argued that the study of immunology, with its roots in the 17th and 18th century, is key to understanding our human condition at the beginning of the 21st century.